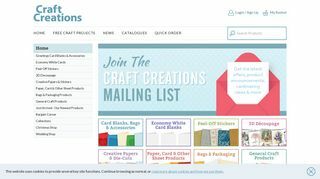 Craft Creations – Offers greetings card blanks and back issues of the magazine. – Offers greetings card blanks and back issues of the magazine. Over the years in Ingersoll House we have added many more machines to our manufacturing department including new scoring facilities to enable us to make single fold cards without the ‘knockout’ marks on the edges. January 2007 saw the purchase of a new ‘state of the art’ waterless digital printing press, this will enable us to maintain the growth, while keeping the price competitive, of our Creative Paper range which is suitable for cardmaking, papercrafts and scrapbooking. We keep in stock well in excess of 1.5 million greetings card blanks and 1 million Gold Label stickers to try to prevent delays in order despatch.